We live in a fast-paced world. And when it comes to social media, it isn’t any different. It’s like watching 24 on steroids! This makes Social Media Automation Platforms a must for every business, marketer and social media manager. These tools can increase your productivity immensely. You can do all your social media work from one dashboard, so no more running back and forth through files and photos trying to manage the content, and no more forgetting to publish a post. Automation platforms will help you make the most of your time and resources, organize as well as manage your marketing team. We already listed the general pros and cons of using social media automation platforms in our previous article. Our focus here is to list those platforms we find most interesting. Hootsuite is a social media automation platform used by over 15 million professionals from different industries all over the world. If the number of your social media clients grows, this is the right content management platform for you. The pricing depends on the plan, which can be Professional, Team, Business, and Enterprise. They additionally offer 30 Day Trial for each plan. The platform is synchronized with over 35 popular social networks. On top of that, HootSuite Academy offers each new user FREE courses such as The Fundamentals of Using HootSuite for beginners and Advanced Uses of HootSuite for those who want to learn more. After you finish the courses the next step is to get certified by taking the Social Marketing Certification. You will pay 199$ for it, but it’s a one-time fee. 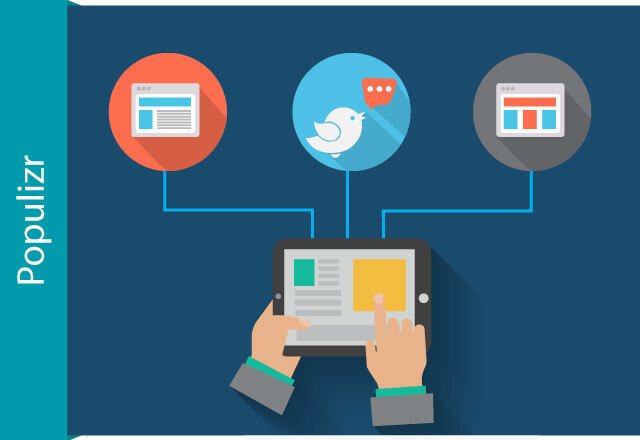 If you want to know more about Hootsuite’s features and capabilities check out this article. Populizr is a perfect platform for scheduling social media campaigns. But one of its most significant values lies in generating multiple unique social media posts from just one blog post. Yup, that just happened! Populizr will give you unique content with 9-25 variations from a single blog, which is mindblowing! This way you will never end up like a boring spammer to your fans/followers. Also, Populizr is so easy to use you’ll love it! What makes Populizr one of the top social media automation platforms is the never-before-seen feature that shows your audience’s reaction to your blog post before it is even posted. How? Well, Populizr measures the sentiment and emotions conveyed in your social post and accordingly concludes how the post will be read. And that is something really important for a social media expert to know, right? Populizr also offers a Knowledge Base with how-to video tutorials, articles, and FAQ which explain every feature so you wouldn’t have to stumble your way through the tool. 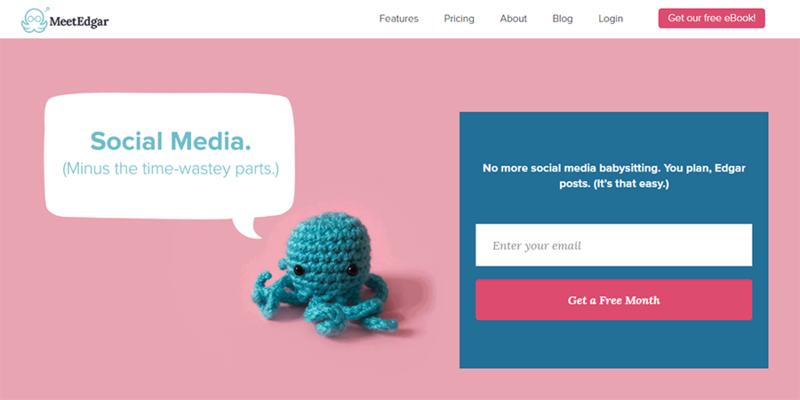 Populizr – Social Media Automation Platform offers different pricing plans, depending on whether you are an individual or an agency. But there is also a $1 for the first-month option. With it, you can really see what Populizr can do and if it is the right tool for you. If you want to collect more leads, Oktopost is the right social media management platform for you. Oktopost is B2B focused. It tracks each lead you generate, provides the analytics to understand which networks, profiles, and posts are most effective. You can Get a Demo before you start paying for the platform. Same as HootSuite and Populizr, Oktopost offers its community an extensive Knowledge Base for those who want to learn more. There is one annoying detail though there is no pricing plan anywhere on the site. If you are interested in the tool you need to contact sales support to request a demo and then get the pricing details depending on the number of user seats, social advocates, social profiles and so on. According to the reviews on Fit Small Business, some system glitches occasionally happen, but customer support is quick to respond and professional. So, that’s a good thing to know. Oktopost offers a lot of interesting features like Employee Advocacy, for example, which enables your employees to share company posts on their accounts via desktop or mobile app. You will have to pay extra cash for it though. In any case, this platform is worth checking out. Next in line is Buffer. 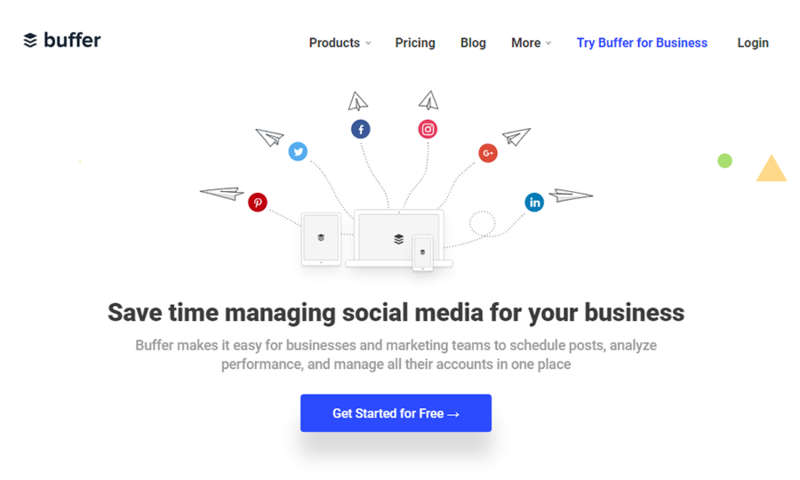 Buffer will help you plan and schedule posts, engage with your customers and analyze the performance of your social media marketing. More than 3 million people use this social media management platform. Like the previous platforms Buffer also offers a good knowledge base including webinars, case studies, and FAQ. The pricing here depends whether you are an individual or a business user. Furthermore, you get a free trial on every package in their pricing list up to 14 days. There is also a Free Plan with 3 social accounts available, but it doesn’t offer those features that are most important for a marketer, so it is better to get the free trial instead and see what the tool is about. Similar to Canva, Buffer offers Image Pablo Creator, which is good for those without Photoshop or Illustrator skills to create post images like a pro. This is actually cool and can work well on a small scale. But as your business grows you will want to invest in a graphic designer(s) and at least one, if not both, Adobe tools Illustrator or Photoshop. You can find out more about Buffer HERE. 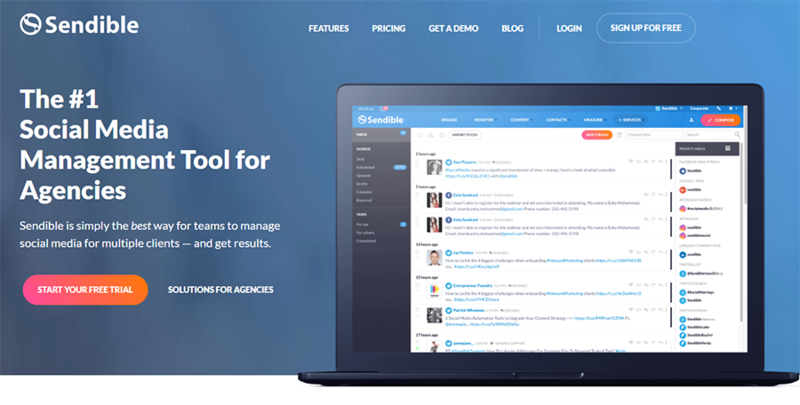 Sendible is a great social media management platform with user-friendly interface and a risk-free 30-day trial on all packages. In these 30 days you can get the feel of the tool, go through all the features and see how they function and then easily decide is it the right one for you. If you are interested to find out more about Sendible we did an extensive REVIEW for you to check out. We chose SyndWire for our list because it supports 49 social networks at once. The platform is suitable for bloggers, social media marketers, affiliate marketers, or SEO specialists. 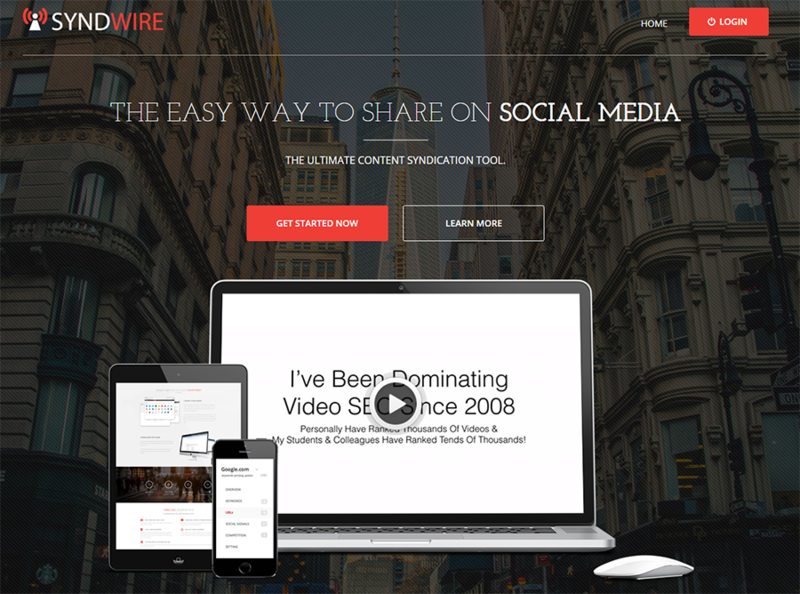 Key features SyndWire boasts with are Video Marketing, Content Marketing, and Social Media Marketing. There are three Pricing Plans: Starter – $99 per month, Pro – $199 per month, and Enterprise – $499 per month. One of the most interesting features to point out is definitely the “Syndwire Content Spinner.” SyndWire users can quickly check duplicate content on social media. However, it’s only addressing it, not solving the problem of automated content rewriting. Their Knowledge Base covers all the FAQ’s for every SyndWire question you could have, plus they offer Live Support Online. Read more details about SyndWire’s PROS, CONS, and FEATURES HERE. 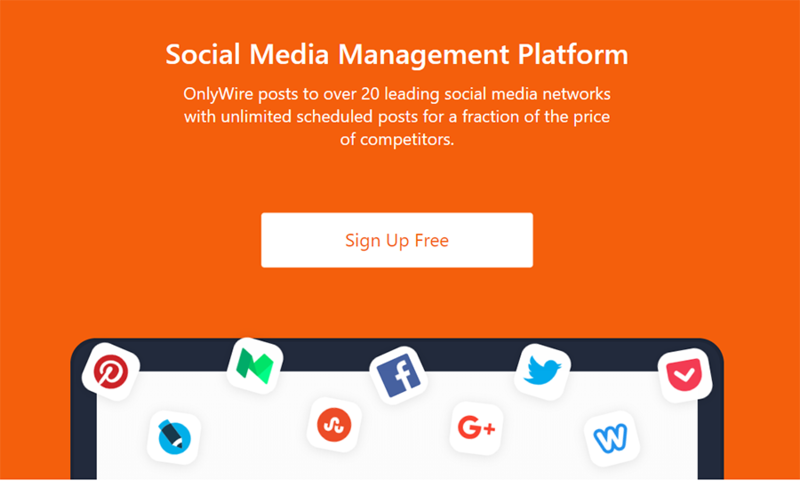 OnlyWire is a Social Media Automation Tools that supports 20 Social Media Networks, including Facebook, Twitter, LinkedIn, and Pinterest. The platform offers three pricing plans including Free (for individuals), Pro (for small business) $9.99 per month, and Enterprise (for agencies) $99.00 per month. This is a straight forward tool, no big surprises, just some common features for managing social media campaigns for multiple clients. Similar to Buffer, OnlyWIre has an entirely free plan if you want to try out the tool, but it doesn’t offer analytics, and you definitely want that one. So, instead, you can get a free trial for Enterprise and see how the tool functions with all the features on. If you use WordPress you will be happy to find out that Onlywire has OnlyWire WordPress plugin for social sharing. On a side note, Knowledgebase and FAQ’s are nowhere to be found, just live chat support. If you are interested to find out more about this platform check HERE. 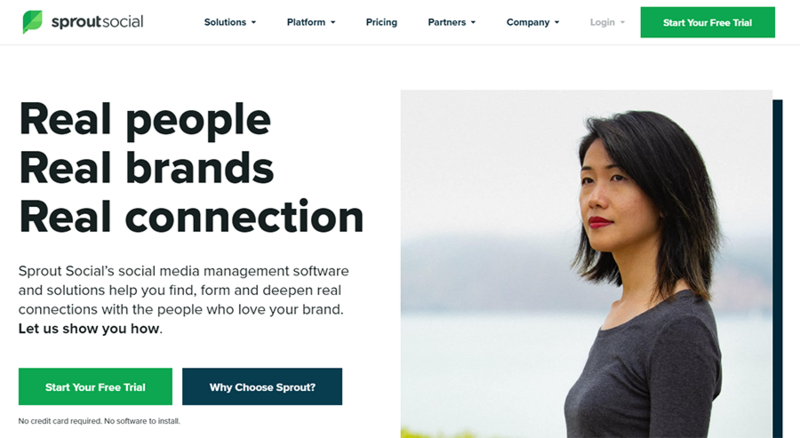 As a social media automation platform, SproutSocial is approachable for businesses of all sizes: small businesses, niche agencies, and big enterprises. All pricing plans include a free 30-day trial. You get to choose between three different plans: Standard, Professional, and Advanced. There is also an option to request a demo under Professional and Advanced plan. This will give you plenty of time to use the tool and check its features and functionality. Key features SproutSocial offers are Analytics, Engagement, Publishing and Listening, as well as some additional features – Collaboration and Automation. Definitely worth checking it out. SproutSocial, as well as most of the other platforms, has an extensive Knowledge Base in the form of a blog, digital publication Adapt, webinars, case studies, and FAQ. You can read more about SproutSocial HERE. And the last on our list is MeetEdgar. If you want to share your content smarter, then this social media automation platform is definitely for you. If you have a blog with lots of content, MeetEdgar will give you some interesting ideas on how to share the same content and still offer “fresh from the oven” approach to your community. The platform stores the updates in a library. When every other update in that category has been posted, MeetEdgar will post the update once again, so a whole new audience can see it while you carry on worry-free. So, they practically recycle the post, offering new creative headlines for that same post. MeetEdgar is a fairly simple tool, and so is the pricing plan, there is just one $49 per month option with 30-Day Money-Back Guarantee if the tool is not what you’re looking for. If you want to get tips, guides, news, and more from the social media world, check out their blog. There is also a Knowledge Base that will get you going. Social Media Automation is a must if you want to work efficiently throughout your working hours. Especially when your business starts to grow, and you have to do social media for multiple clients. This task quickly becomes so big it is virtually impossible to do without an automation tool. But how to pick the right one? This is why we presented you with our top 9 best automation platforms worth considering. If you are a marketing specialist, a small agency team or an enterprise, still revising what would be the best solution for you, then the best way to tackle this would be to analyze your business and communication plan. Then, create a simple list that will serve you as a benchmark. List the social networks where you already have a presence with the brands you manage, and write down your KPI’s per each social media network per brand. The next step is to calculate your budget and analyze the pricing plans each social media automation platform offers. After some calculating and free trials on different platforms, you can reasonably quickly decide what’s the right social media automation platform for you. Hopefully, we gave you enough choices to get you started on your new automation tool. Happy hunting!